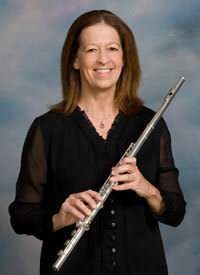 Lynn Vogl joined the Kishwaukee Symphony Orchestra as principal flutist in 1992. She teaches privately and also performs in chamber music groups in the area. She has a bachelor’s degree in music education from the University of Illinois and a master’s degree in music from Northern Illinois University. After teaching music for many years in the public schools she began a new career as an RN. She is currently employed at the DeKalb County Health Department. Beethoven and Faure are two of her favorite composers. Classical music has been a lifetime love and inspiration, and Lynn is thankful for the opportunity to play all of the music that the Kishwaukee Symphony Orchestra performs. .